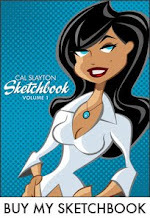 cal slayton | illustrator | graphic designer | comic book artist | dallas | dfw: A Sign of the Apocalypse? 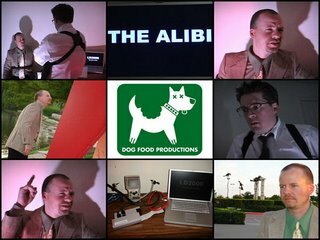 If you've ever clicked on the link on the right hand side of this page that reads "Dog Food Productions", then you might know that a group of friends and I often make these little stupid films in our spare time. And I stress "stupid" and "spare". Well, from time to time we also compete in the Video Association of Dallas' annual 24 Hour Video Race. If you're unfamiliar with the reace, teams meet at midnight on Friday, they give you a line of dialogue, a location, a prop and a theme. Then you have 24 hours to make a 5 minute film that incorporates those elements and get it to the finish line by midnight Saturday. In 2003, we did "The Solicitor". We finished the film in time, had it edited and completed, but were unable to get it on the mini DV tape they need it on due to technical issues. So that sucked. 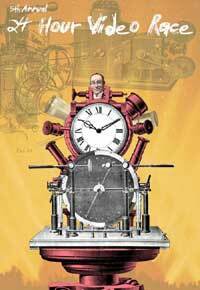 In 2004, we did "Change" and got it in on time and had it screened at the Angelika Theater for the Semi-Finals. And we didn't advance. Oh well, it was still fun to do and great to see our lame movie on the big screen. In 2005, we didn't compete. This year, we were back. We finished in time. Had our screening. And lo and behold, we advanced to the finals. So on Tuesday, May 23 at the Angelika in Dallas, we compete in our team category. I'm pretty sure we won't win, but it's still cool. Line of Dialogue: "That's what I'm talking about." I did the 24 hour video race with Mondo Mike (formerly of the Edge) about 3 years ago. Wow, whatta blast! I told him I wanted to direct the next time but I haven't tried it again. Maybe next year! Congrats on getting to the finals!